kdice is a free multiplayer online game that is similar to Risk, and I’ve just wasted an entire evening playing it (and mostly losing). It was created by Ryan Dewsbury using the Google Web Toolkit and has a Flash interface. Ryan also created gpoker, an Ajax Texas holdem poker game and one of the first applications built with the Web Toolkit. We covered gpoker here back in July. kdice is a lot like the Risk board game, although the games go very quickly. Like gpoker, kdice also has real time chat between players. Not much else to say about it – it’s a fun application that makes me remember the hours and hours I spent playing Risk as a kid. 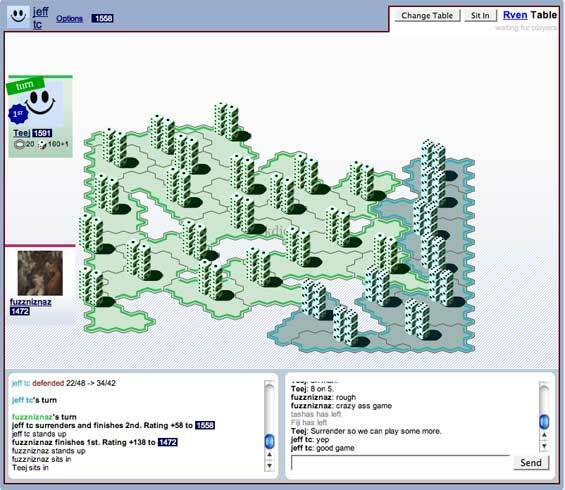 If anyone knows of any other good online Risk-inspired games (besides Grand Strategy), let me know.